In search of new nail art? Then look no further! We have been checking out many amazing nail designs and have found 23 cute nails that you need to see. There is an awesome array of nail ideas from quirky patterns to bold colors. Our top picks are perfect for anyone who has been bored with their nails and wants to try something new and stylish. You won’t be able to decide which one to try first! 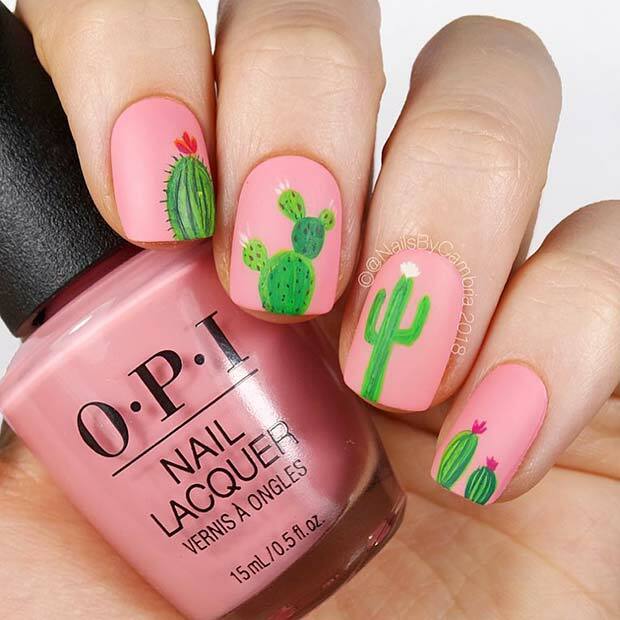 First up, we have these super cute cactus nails. There is a different cactus painted on each nail and you can recreate this look or maybe choose one as an accent nail. It is a fun and creative idea that is perfect for the ladies who like to look unique. You can view the tutorial and the polishes used on the artist’s page featured below. Brighten up your look with these rainbow stripes. 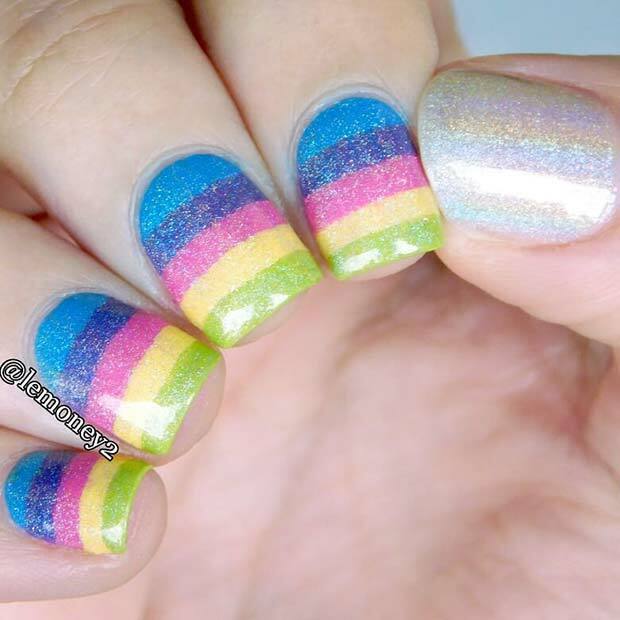 Each nail has a vibrant stripe of color with a beautiful shimmer over the top. These are so pretty and colorful, this is a manicure that will make you stand out from the crowd. To create stripes like this you can use tape and there are easy to follow tutorials online. Next, we have an adorable animal design to show you. These nails are a light pink color with two accent nails. 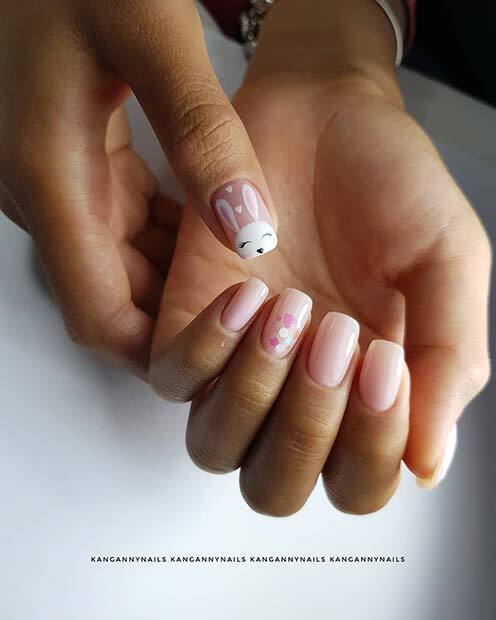 One accent nail has beautiful pink dots and the other has a cute bunny design. This is a pretty and unique idea. Recreate the bunny look or use an animal of your choice. Our next idea is mermazing! The nails are black with a sprinkle of glitter and there is one mermaid scale accent nail. This is a beautiful and trendy idea. 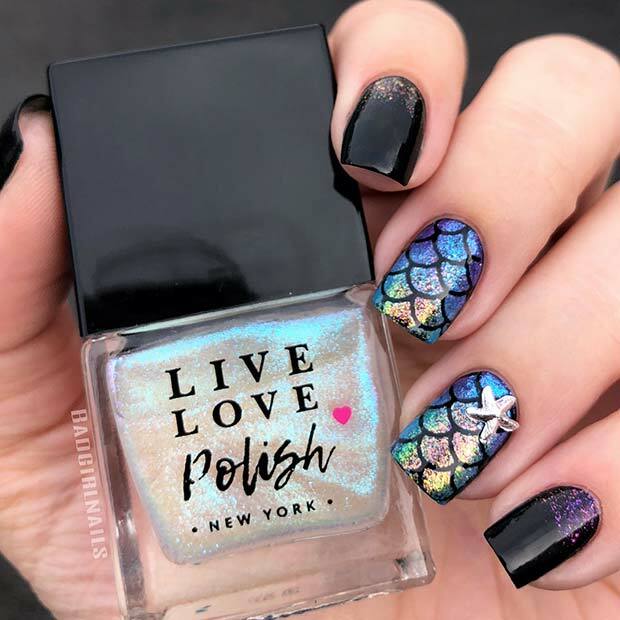 It is the perfect manicure for the ladies who love mermaids and who like looking stylish. There is a short tutorial on the artist’s page below and you can also check out the polishes used to create the look. We love this idea! Disney nails are stylish and cute. Here we have a gorgeous example. 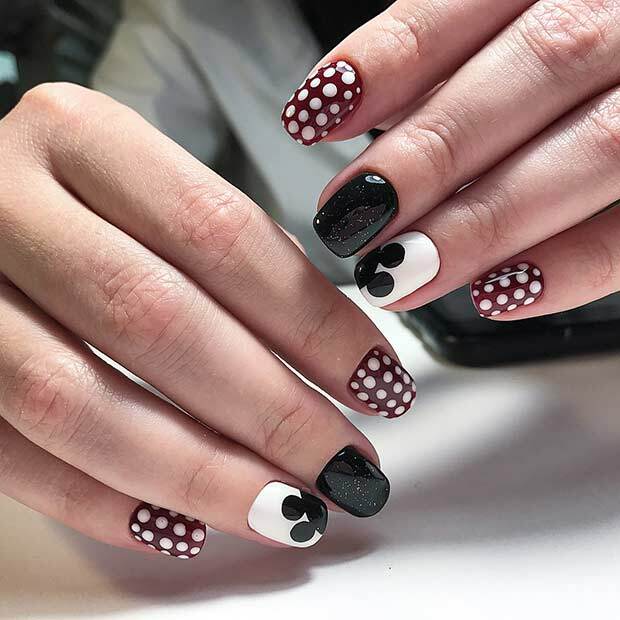 These nails are black and white with dark red polka dot nails. Polka dot design is quite simple to create if you have not tried it before. You can use a dotting tool or if you have a steady hand, use a thin brush to make the pattern. Recreate this look or try other bold base colors. 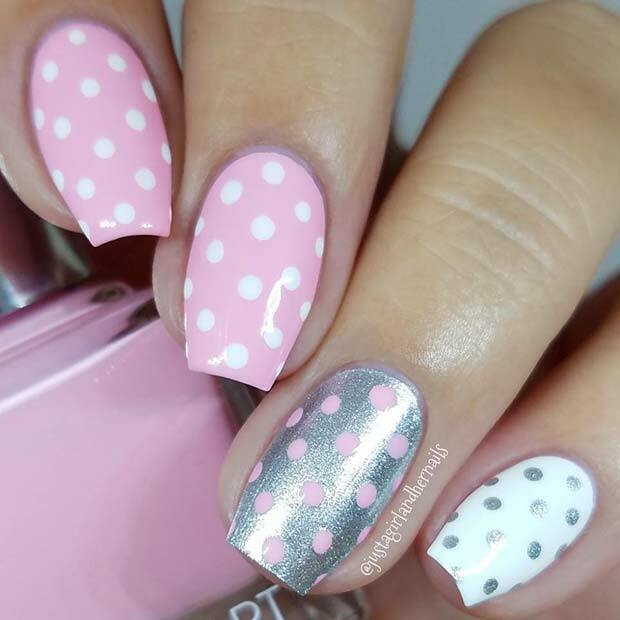 Polka dots like these are so stylish and pretty. 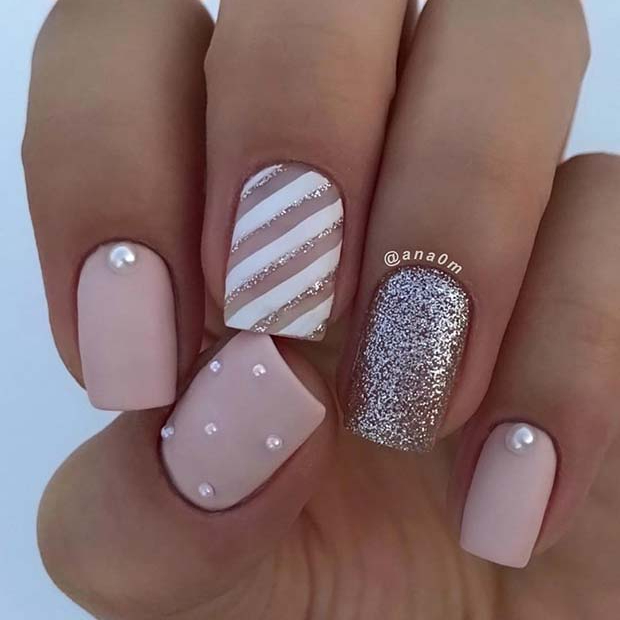 The nails use a beautiful pink, white and silver color palette. Some of the nails are pink and white polka dot, the next nail is silver and pink and the last nail is white and silver. This is an elegant and trendy way to wear polka dots. You can create this look or use polka dots with your own color combo. You can hand paint the dots or use a stencil. Next, we have a bold nail idea that features a cute heart design. Most of the nails are dark blue or purple with a heart accent nail on each hand. One accent nail has one heart and the other has multiple small hearts. You can recreate the whole look or use one heart design. The nails can be any color too. Give your nails a fun and unique look with a design like this one. The nails are bright pink with two accent nails. One of the nails is white, the next nail is glitter green while the rest have a super cute melon design. 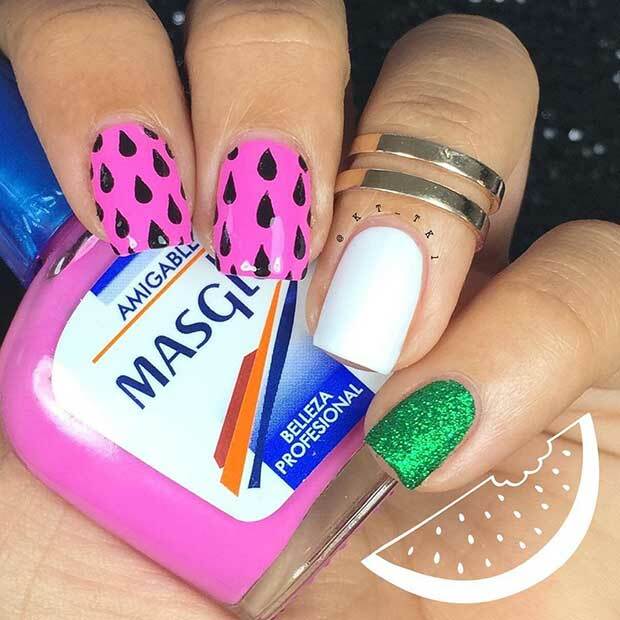 This is great take on the classic watermelon nail design and it would be a great idea for summer manicures or on the days where you to have a little fun. Love bold nails? Then this idea is perfect! 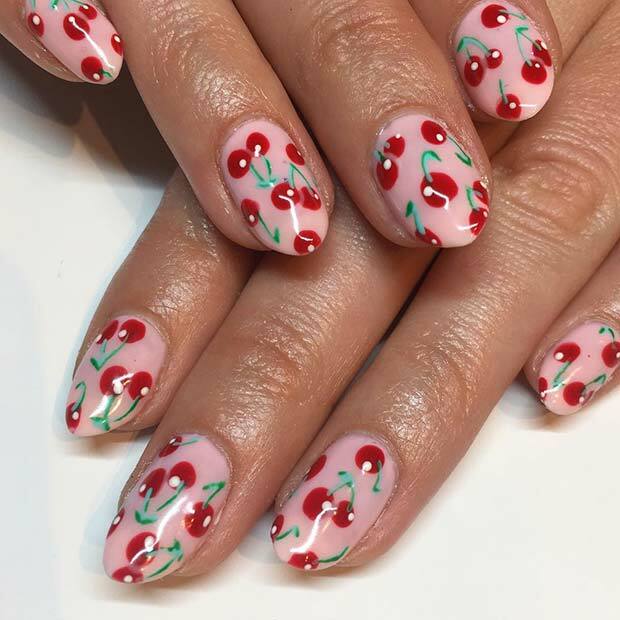 These nails feature a vibrant cherry pattern. The pattern gives the nails a cute, vintage vibe. You can hand paint cherries like these or you can buy pretty cherry nail stickers to give you a similar look. We love this nail idea! Our next idea is elegant and chic. Most of the nails have a different design. 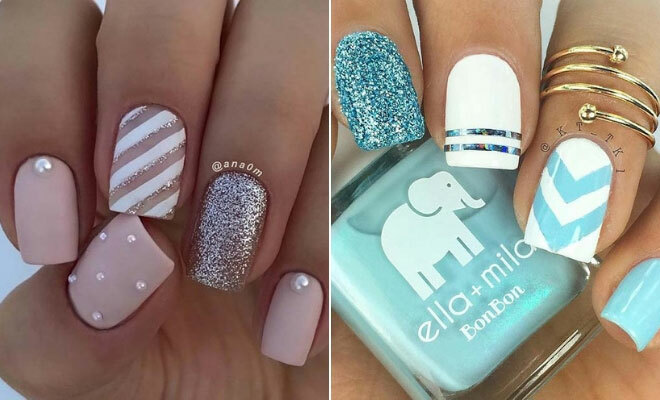 Two of the nails have a light polish with a pearl, the next nail is glittery with stripes, then all over glitter and finally a light nail with small pearls. Recreate all of the nail designs or just pick the ones you like best.